2. Quiz for Youth: Are You Ready to Transition to Adult Health Care ? With our National Young Adult Transition Advisory Group, Got Transition has created a Youth Health Care Transition Quiz for youth and young adults to find out how ready they are to transition to adult care. The quiz asks about major issues important during transition years. It also gives tips and resources to address many health care transition questions, including how to add their medical information to their smartphone, what legal changes happen at 18, and how to sign up for health insurance. 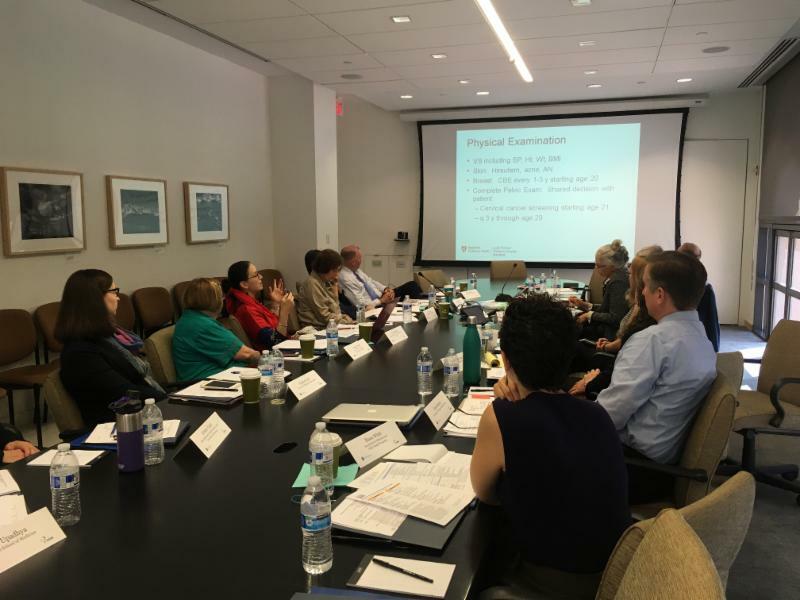 Got Transition continues to work with several large health systems (Henry Ford Health System, University of Rochester Medical Center, Cleveland Clinic, Walter Reed Medical Center, Children’s Mercy Hospital Kansas City) to implement the Six Core Elements of Health Care Transition. As part of our ongoing newsletter series, Got Transition interviews Dr. Tisa Johnson-Hooper (Medical Director, Center for Autism and Developmental Disabilities), who discusses the Henry Ford Health System’s (HFHS) implementation of the Six Core Elements. HFHS is a comprehensive, integrated, non-profit health care organization located in Metro Detroit, consisting of 30 health centers and 7 hospitals, averaging about 130,000 patient visits per year. Q: Why is HFHS focusing special attention on health care transition? A: HFHS is moving toward a population health and integrated care model. Consistent with national trends, HFHS has noted a gap in primary care among youth ages 17-22. Over 40% of these youth seen in HFHS pediatrics and family medicine primary care practices during their childhood years do not pursue continuous primary care with HFHS after the age of 18. Developing a process that engages and supports this patient population as they transition from a pediatric to an adult model of care is essential to achieve optimal health care outcomes. Q: What clinical process changes have you made to ensure that youth and young adults move from pediatric to adult health care? A: We created a Health Care Transition Quality Improvement (QI) Team consisting of 2 pediatric and 2 adult practices for the purpose of customizing the Six Core Elements of Health Care Transition to coincide with the clinic processes in our health system. Thereafter, we piloted our customized tools within our primary care practices. Based on 3 years of work, we have integrated four Core Elements (transition policy, readiness assessment, transfer of care, and transfer completion) into the pilot clinical sites. We are currently in the process of disseminating the policy and readiness assessment throughout the entire health system. Q: Have your changes shown any positive results for your system and patients? A: We began a Meet & Greet pilot 9 months ago. 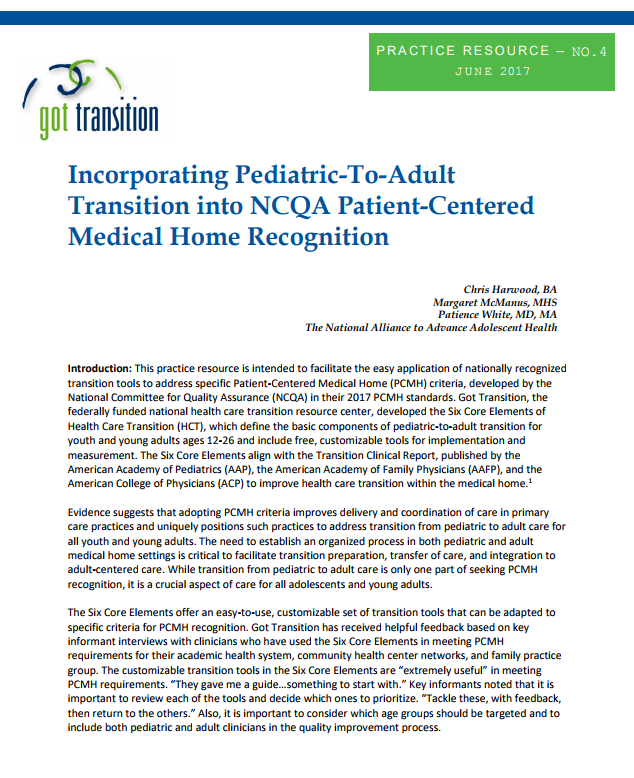 This pilot assesses the integration of both pediatric and adult core elements related to transfer of care and transfer completion into our clinical practices. The Meet & Greet pilot is a comprehensive referral system from pediatric to adult medicine. The process begins in pediatrics, encompasses a bridge period of time when specific electronic information and resources are provided to the patient, and ends with an appointment in adult medicine. Initial patient satisfaction surveys have been overwhelmingly positive. Specifically, youth are communicating that they feel more knowledgeable about their health and are prepared to transition to adult medicine. Q: What are the main lessons learned from this work? A: The main lesson learned regarding integration of the Six Core Elements into a large health system with an established electronic medical record, like Henry Ford, is to be patient. Once tools have been customized, going through the required institutional committees, boards, and IT reviews can be lengthy and trying. However, each step serves a valuable purpose and ultimately facilitates successful and sustaining implementation. 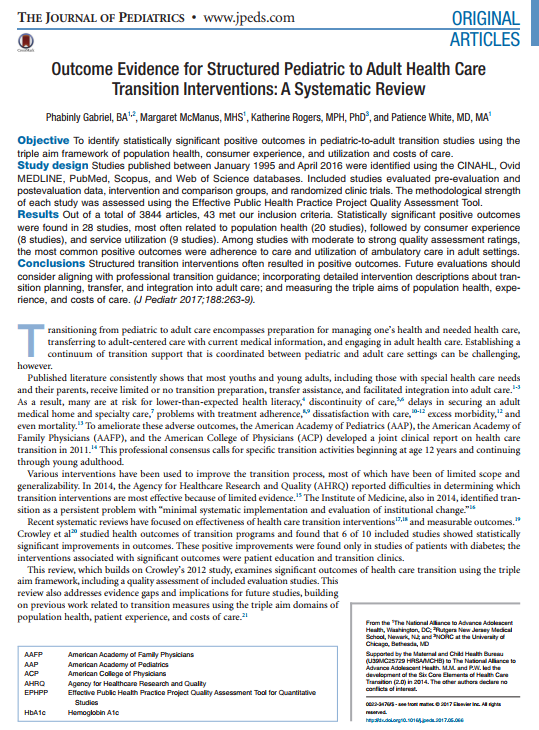 Got Transition has published a systematic review in The Journal of Pediatrics that identifies statistically significant positive outcomes in pediatric-to-adult transition studies using the triple aim framework of population health, consumer experience, and utilization and costs of care. The systematic review, “ Outcome Evidence for Structured Pediatric to Adult Health Care Transition Interventions: A Systematic Review ,” found that structured transition interventions resulted in statistically significant positive outcomes in 28 out of 43 evaluation studies, most often related to adherence to care and utilization of ambulatory care in adult settings. Got Transition is collaborating with University of California, San Francisco’s Adolescent and Young Adult Health National Resource Center on a new project to develop recommendations for incorporating health care transition into preventive care for all adolescents and young adults including those with special needs. The project involves convening a group of experts in adolescent health, preventive care, and transition to create a toolkit for clinicians with sample questions, anticipatory guidance, and linked tools for early, middle, and late adolescent age groups and young adults. With funding support from the Lucile Packard Foundation for Children’s Health , Got Transition will convene an expert committee of public and private payers and health plan leaders to develop recommendations and action steps for advancing payment innovations in pediatric-to-adult transition care. This year-long effort is intended to reduce the payment barriers that impede the adoption of evidence-driven transition approaches. The American Academy of Pediatrics (AAP), with Got Transition, announces a new series of transition webinars on techniques to support improvements in transition planning, transfer of care, and integration into adult care using quality improvement processes. 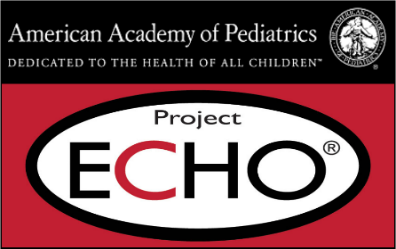 Using a TeleECHO format, each clinic will include a brief presentation by a national transition expert followed by a discussion of practice-based challenges, problem solving guidance, and lessons learned. The topics will include 1) incorporating health care transition improvements into your practice, 2) establishing and implementing a transition policy, 3) conducting self-care skills assessment and incorporating into a plan of care and/or problem list, and 4) transfer preparation, follow-up, and feedback. For more information, contact Amy Shah at ashah@aap.org . The Society for Adolescent Health and Medicine (SAHM) has developed a new Adolescent Medicine Resident Curriculum, which has been divided into 10 core content modules and is designed both for four-week adolescent medicine rotations and for residents’ longitudinal training. The tenth core content module is dedicated to Transition to Adult Care , with the following learning objectives that are linked with educational and clinical resources: 1. Describe the timing and progression of transition preparation during adolescence; 2. Identify at least one tool for assessing youth readiness for transition; 3. Delineate the key components of transition preparation and implementation; and 4. Describe the objectives and measurable outcomes of transitional care. Got Transition Welcomes Two New Hires! 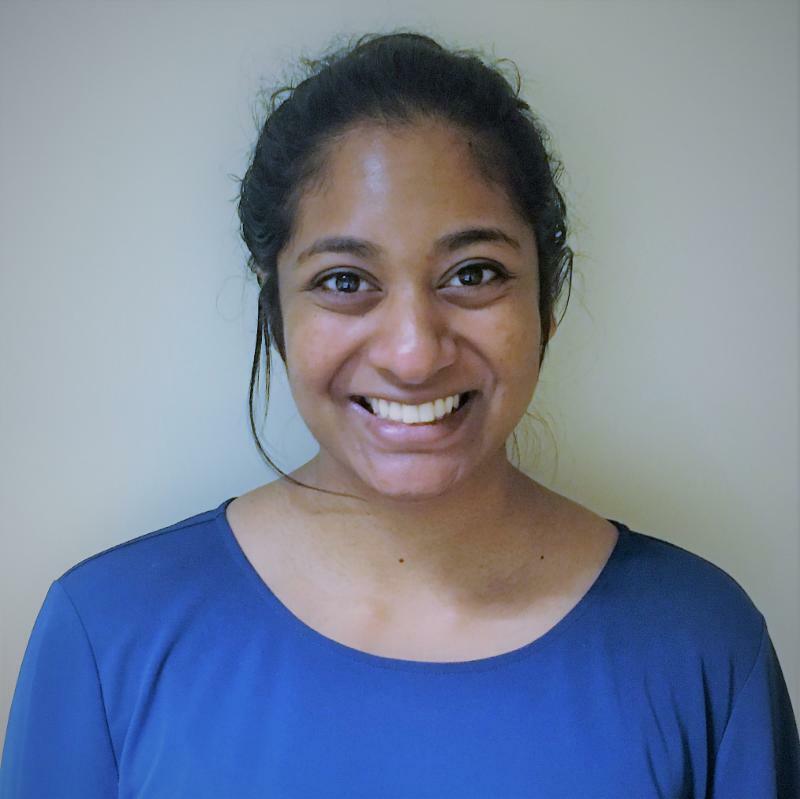 Samhita Ilango is responsible for assisting with health care transition research and quality improvement activities nationally and in the District of Columbia. Ms. Ilango has experience in autism research as well as in reproductive health research. She received her Bachelors degree in Cognitive Science from Johns Hopkins University and is currently completing a Masters degree in Public Health, focusing on health policy at Johns Hopkins Bloomberg School of Public Health. 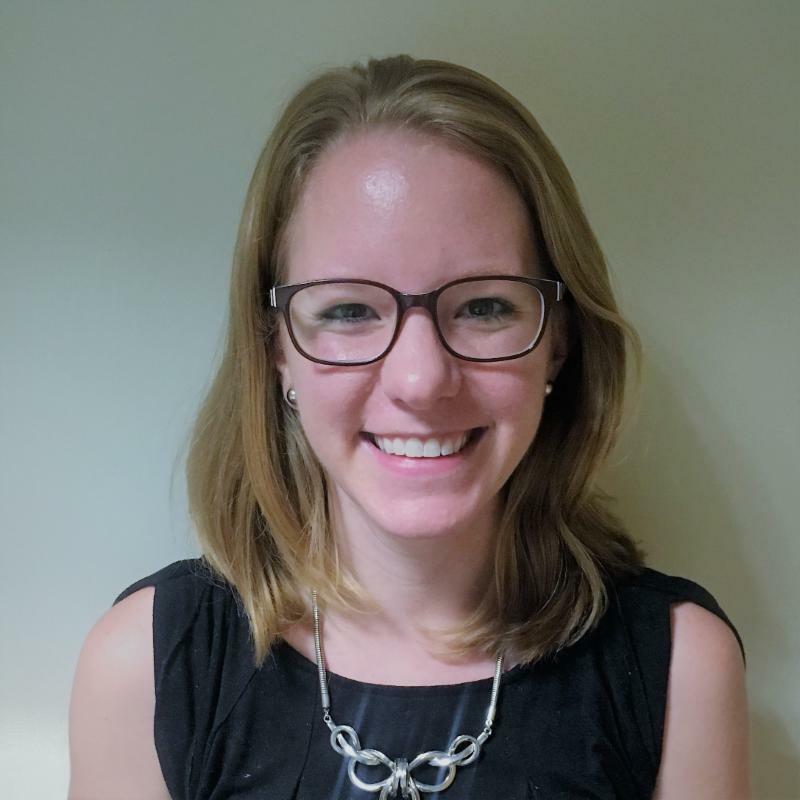 Annie Schmidt is responsible for assisting with research and policy analysis related to adolescent health, preventive care, and transition payment options. Ms. Schmidt has participated in health research with underserved and vulnerable populations, with particular focus on mental health, communication of tobacco health risks, and tobacco control legislature. She received her Masters of Public Health from the University of North Carolina in Chapel Hill and a Bachelors of Arts in Psychology from Kenyon College.